May ushered in a lot of political news, but most of it had to do with the people running to replace the current president rather than with Obama himself. In other words: 'Tis the season of presidential campaign announcements. A protracted fight is happening in Congress over giving President Obama "fast-track authority" on trade deals, but this is really just the preliminary round before the big fight over the Trans-Pacific Partnership deal happens. Trade is an issue that tends to split the Democratic Party, and Obama is actually spending time lobbying Republicans in Congress to support his trade negotiation power (much to the surprise of some of these Republicans, I might add). But the main focus of the chattering classes in Washington was on the 2016 race. Jeb Bush bungled an answer about Iraq, which fed the grist mill for a couple of weeks, and it seems like you can't turn around these days without hearing about another candidate jumping into the race. This dynamic is going to continue for quite some time (there are still plenty of candidates who will be announcing in June), and then the real primary campaign will get underway all summer long (the first Republican debate is in August). So the political media is going to lose a lot of focus on Obama in favor of the endless horserace stories about the campaign trail. I'm not sure whether this dynamic will help or hurt Obama's standing with the public, so we'll have to see how it all plays out, but the 2016 campaign season is now fully underway. In May, Obama managed a small bump upward in his monthly average job approval, to 45.4 percent. 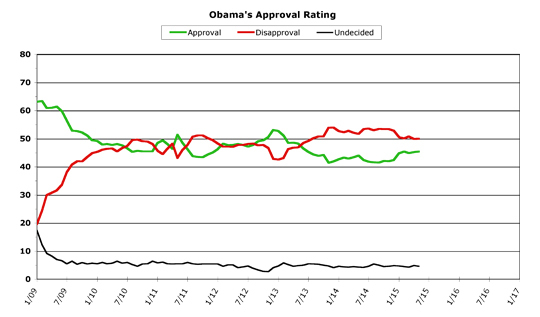 Obama's monthly average disapproval took a minimal step up as well, to exactly 50.0 percent. 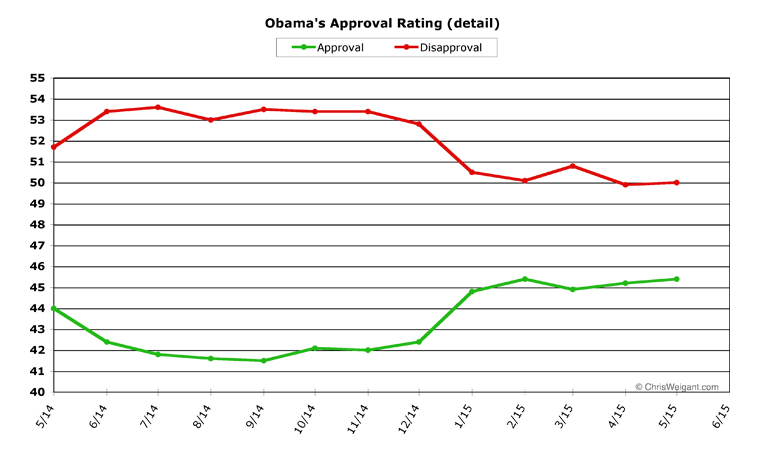 This represented a change of 0.2 percent upward for Obama's approval and a 0.1 percent rise in disapproval. All around, a pretty flat month. Obama did manage to shrink the gap between disapproval and approval to the lowest it's been in almost two years, at only 4.6 percent underwater, but this was only a gain of 0.1 percent -- again, even the good news is pretty flat. In May, Obama wound up almost exactly where he was in February. 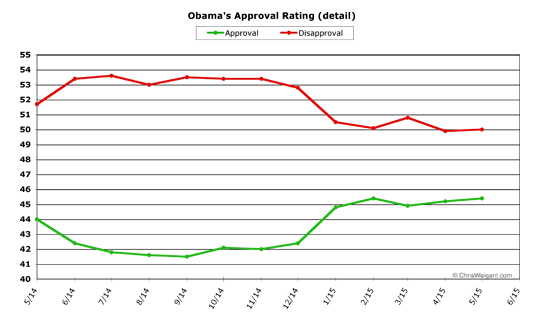 His approval fell 0.5 percent in March, then rose 0.3 and 0.2 percent to wind up right back where it started. His disapproval fluctuated even more, rising 0.7 percent in March, then falling 0.9 percent, only to rise 0.1 percent to wind up only a tenth of a point off from where it was in February. Finding any sort of overall trend is tough, when the lines are so flat. Obama has held on to the big gains he made in December and January, but he has hit yet another plateau since then. Watching the daily polling averages doesn't shed much light either, since they have gone up and down but essentially stayed in a very tight range for four months now. While last month it appeared Obama's numbers were headed for improvement, this month ended on a slight downturn. June has two big deadlines at the end of the month which could influence public opinion, but the effect is likely to be limited, at least until July. The first of these is actually pretty obscure, as Congress gears up to have a big fight over a government agency few have even ever heard of -- the "Export-Import Bank." The Tea Party Republicans are on a crusade to eliminate the bank, which is odd because it is a government program that actually makes a profit. The second big news we might be hearing at the end of June is a bigger deal, though, since it is the deadline to reach a nuclear agreement with Iran. Whether they'll make the deadline or not, the subject will be in the news at the end of June, but since these negotiations are not known for actually hitting their deadlines, it's easy to predict the talks might spill over into July. Even if an agreement is announced, the big political debate about it in America will likely take place in July. The other big political news which will happen in June might affect President Obama more, even if it does come from a different branch of the federal government. June is the big month for Supreme Court decisions, and there are two which will be big news no matter what happens -- the case over the wording of the Affordable Care Act and the one which will determine whether gay marriage will become the law of the land across America. Your guess is as good as mine on which way these two big cases will go, but either way the decisions will spark off a big debate, that's my guess. But Obama could be in for another flat month, barring any unforeseen events, or actions from the president. Right now it's looking like Obama could slip a bit in June, but the way the numbers have been cycling, that could easily change during the month. At this point, the safe money would be on "not much change at all" for June. For practical purposes I'd say his numbers have been flat since the summer of 2010. Forty-five favorable, fifty-five unfavorable, five undecided, with a ten percent meander range for favorable and unfavorable ratings. Midpoint in the meander right now. I think this concrete has pretty much set. Your guess is as good as mine on which way these two big cases will go, but either way the decisions will spark off a big debate, that's my guess. 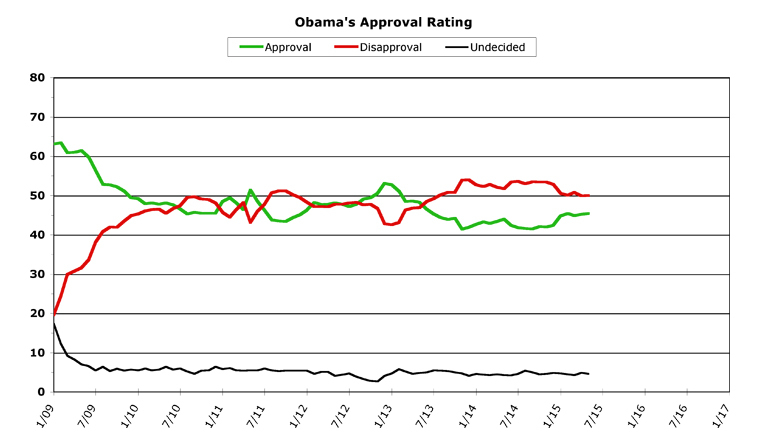 If Obama loses ObamaCare (which is likely) it may affect his June Poll Standings. Depends on if the SCOTUS releases the verdict in the first part of the month or the last part of the month..
New Jobs numbers are out..
Yeah, but I gotta write about something every month!